Domaine Duseigneur was founded by Jean Duseigneur in 1967. In those formative years, Domaine Duseigneur was in rough condition and needed extensive work in the cellar and more importantly, in their vineyards. In 1992, his son Frederic Duseigneur along with his brother Bernard Duseigneur took over managing their Southern Rhone property. They changed their vineyard management techniques starting with the 2004 vintage and became certified biodynamique by Ecocert three years later. They are also a member of Biodyvin, the International Bio-dynamic Vine growing Syndicate. in 2007, they brought in Philippe Cambie to consult on the vineyards and wine making. Domaine Duseigneur became so well-known for their biodynamic outlook and vineyard practices that in 2012, Frederic Duseigneur founded his own company that focused on consulting other vintners on biodynamic farming techniques. In 2013, Bernard Duseigneur bought 12 hectares of vines from Domaine Monpertuis. Starting in 2014, the wines of Domaine Duseigneur will be made in the former cellars of Montpertuis. Domaine Duseigneur owns 12 hectares of vines in Chateauneuf du Pape, 11 hectares in the Cotes du Rhone appellation and 5 hectares in Lirac. They also produce an IGP. In Chateauneuf du Pape, their terroir is a mix of rocks, pebbles, red clay and sandy soils. All the vineyards of Domaine Duseigneur are farmed using only organic and Bio-Dynamic vineyard management techniques. They have old vines some of which were planted as far back as 1885. 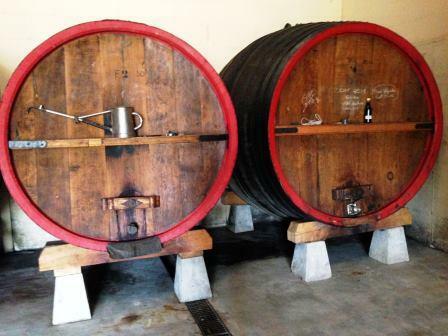 Domaine Duseigneur produces 2 red Chateauneuf du Pape wines and 1 Chateauneuf du Pape Blanc. Domaine Duseigneur Catarina is produced from almost 100% Grenache, with small amounts of Syrah and Mourvedre, depending on the vintage. The terroir is rocks, sand and limestone soils. The vines are planted in the Barbe d’Asne, Colombis, la Croze, and les Galimardes lieux-dits. The wine is aged in demi-muids for 12 months before bottling. Domaine Duseigneur Joanna is made from 100% old vine Grenache. The grapes are selected from specific parcels of very old vines in the Colombis lieu-dit, where you encounter limestone soils. Some of the vines used for this cuvee planted in the Colombis lieu dit are over 130 years of age! The wine is aged for 18 months in mostly new, demi-muids. The production is less than 175 cases per vintage. Domaine Duseigneur Chateauneuf du Pape Blanc Catarina is made from an interesting blend of 50% Bourboulenc and 50% Clairette. The wine is vinified and aged in stainless steel tanks. The production is close to 200 cases per year. Domaine Duseigneur can be enjoyed on the young side. Young vintages can be popped and poured, or decanted for about 1 hour, give or take. This allows the wine to soften and open its perfume. Older vintages might need very little decanting, just enough to remove the sediment. Domaine Duseigneur is usually better with 2-4 years of bottle age. Of course that can vary slightly, depending on the vintage. In the best vintages the wine should be consumed within 4-12 years after the vintage. Domaine Duseigneur is best served at 15.5 degrees Celsius, 60 degrees Fahrenheit. The cool, almost cellar temperature gives the wine more freshness and lift. Domaine Duseigneur is best served with all types of classic meat dishes, veal, pork, beef, lamb, duck, game, roast chicken, roasted, braised, stewed dishes, sausage, barbecue and cassoulet. Domaine Chante Perdrix is also good with Asian dishes, hearty fish courses like tuna, mushrooms, salmon, pasta, eggplant, tomatoes and cheese. The white wine of Domaine Duseigneur is best served with a myriad of different seafood dishes, shellfish, crab, lobster, sushi, sashimi, chicken, pork and veal, as well as Asian cuisine. Domaine Duseigneur also produces red and white wine from vineyards they own in the Cotes du Rhone Villages and Lirac appellations. Polished textures, sweet, fresh and spice red berries and a boat load of cracked black pepper create the wine. Full bodied, and loaded with spicy kirsch, the wine is made from 100% old vine Grenache. With a fresh nose of Provencal herbs, thyme, pepper ad earth, the wine is medium bodied, with a blast of peppery, sweet,, black raspberries. Luscious and lusty, the wine is made from 85% Grenache, 10% Syrah and 5% Mourvedre. Sweet, peppery fruits, medium bodied, with a luscious texture and good freshness in the kirsch and black raspberry lined finish. Medium bodied with dark, ripe, sweet cherries, licorice and an oaky, dusty, earthy, red berry finish. Cherry and black pepper make a nice combination, coupled with the ease of early drinkability, medium bodied, soft textures and sweet, ripe fruits. The wine was made from a blend of 85% Grenache, 10% Syrah and 5% Mourvedre. Medium bodied, polished and smooth, the wine focuses on its fresh, spicy, kirsch and fresh herb personality. Polished, juicy black cherries and rich plums with the right amount of sweetness, earth and spice.